In this first Sunday of Lent, the Church asks us to focus our attention on renewing our relationship with God, contemplating our sinful nature and the "righteous act" of Jesus in removing the stain of original sin. In our readings today, we hear a tale of two temptations, both very similar and by the same tempter. But two very different results: the first Adam succumbs to the temptation to be "like gods" and the second "New Adam", Jesus, rejects the devil with the words, "You shalt not put the Lord, your God, to the test". In our first reading (Genesis 2:7-9, 3:1-7), We hear the from the creation story of Adam and Eve's fall to Original Sin, giving in to the temptation of the Devil and failing to trust God completely. The LORD God formed man out of the clay of the ground and blew into his nostrils the breath of life, and so man became a living being. Then the LORD God planted a garden in Eden, in the east, and placed there the man whom he had formed. Out of the ground the LORD God made various trees grow that were delightful to look at and good for food, with the tree of life in the middle of the garden and the tree of the knowledge of good and evil. Now the serpent was the most cunning of all the animals that the LORD God had made. The serpent asked the woman, "Did God really tell you not to eat from any of the trees in the garden?" The woman answered the serpent: "We may eat of the fruit of the trees in the garden; it is only about the fruit of the tree in the middle of the garden that God said, 'You shall not eat it or even touch it, lest you die.'" But the serpent said to the woman: "You certainly will not die! No, God knows well that the moment you eat of it your eyes will be opened and you will be like gods who know what is good and what is evil." The woman saw that the tree was good for food, pleasing to the eyes, and desirable for gaining wisdom. So she took some of its fruit and ate it; and she also gave some to her husband, who was with her, and he ate it. Then the eyes of both of them were opened, and they realized that they were naked; so they sewed fig leaves together and made loincloths for themselves. 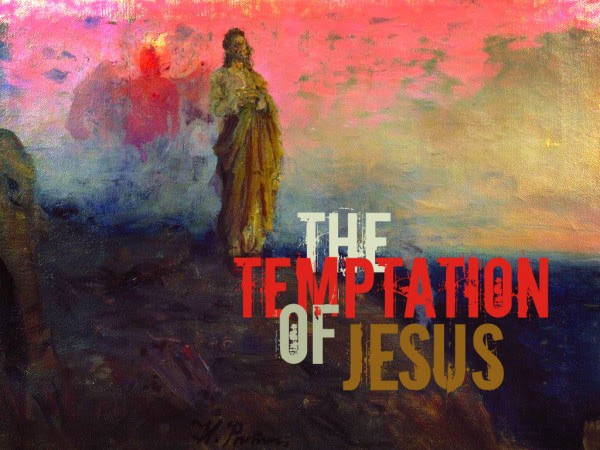 In our Gospel reading (Matthew 4:1-11) we hear how Jesus was tempted three times by the Devil and each time, rejected and overpowered by Jesus. In a sense, a "do-over" of the first temptation but this time with completely different results..
Then the devil took him to the holy city, and made him stand on the parapet of the temple, and said to him, "If you are the Son of God, throw yourself down. For it is written: He will command his angels concerning you and with their hands they will support you, lest you dash your foot against a stone." Jesus answered him, "Again it is written, You shall not put the Lord, your God, to the test." Then the devil took him up to a very high mountain, and showed him all the kingdoms of the world in their magnificence, and he said to him, "All these I shall give to you, if you will prostrate yourself and worship me." At this, Jesus said to him, "Get away, Satan! It is written: The Lord, your God, shall you worship and him alone shall you serve." Then the devil left him and, behold, angels came and ministered to him. In our Epistle reading (Romans 5:12-19), St. Paul explains how the effects of Adam and Eve's original sin were undone by the righteous act of Jesus in rejecting the Devil's empty promises and trusting completely in the Father. Brothers and sisters: Through one man sin entered the world, and through sin, death, and thus death came to all men, inasmuch as all sinned. For if, by the transgression of the one, death came to reign through that one, how much more will those who receive the abundance of grace and of the gift of justification come to reign in life through the one Jesus Christ. In conclusion, just as through one transgression condemnation came upon all, so, through one righteous act, acquittal and life came to all. For just as through the disobedience of the one man the many were made sinners, so, through the obedience of the one, the many will be made righteous. Our readings today remind us of what a slippery slope one sin can put us on and how the only response to temptation is to trust in God completely and rely on his strength rather than our own.